Earlier this year, we launched the BuiltWith Keyword Reports. Now you can search hundreds of millions of websites, not just for the technology they use, but the keywords in their domain name or on their homepage. We nicknamed this a “B2B Search Engine” because like popular search engines it lets you search for keywords and phrases and download reports over the entire internet, where as with consumer search engines such as Google, they make you page through the results and they are more than likely geo-targeted – which is great for consumer use but not for business searches. From the list of websites which feature your chosen keyword you can create a report, generate a lead list and filter further to find exactly the sites you’re looking for. In the steps below, I’ll show you how to create a new keyword report and quickly find a list of sites that would be much, much more difficult to find using any other method. 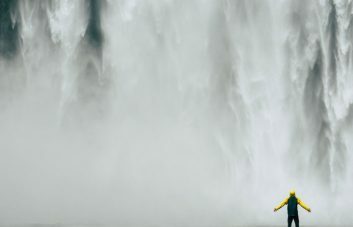 You’ll see below just how quick and easy it is to generate a list of highly relevant leads who all use a “paid-for” technology. For this walkthrough, let’s assume we’re looking to generate a list of leads of that all sell aromatherapy products using an eCommerce store powered by Magento. 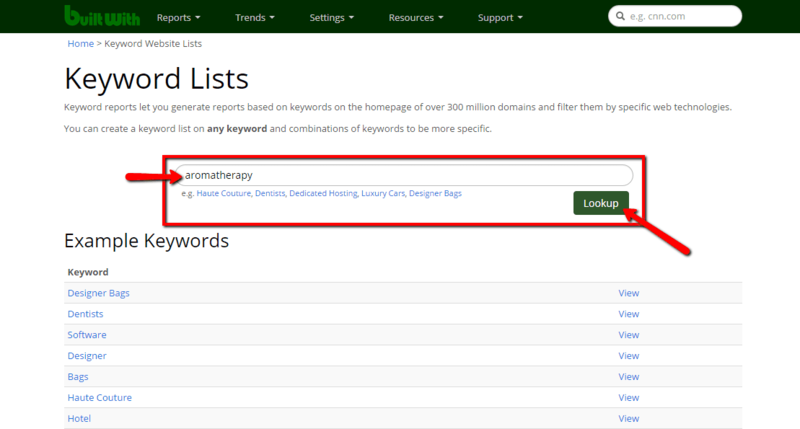 I’ll be using the keyword “aromatherapy” and looking for sites that use the keyword either on their homepage or in their domain name. You could use exactly the same approach to search for any other keyword or phrase instead. In the same way, later I’ll be filtering my list to find sites that use Magento. You could filter the list to find sites that use any of the technologies we track (which is a lot). The first step is to create a new report based on a keyword list. 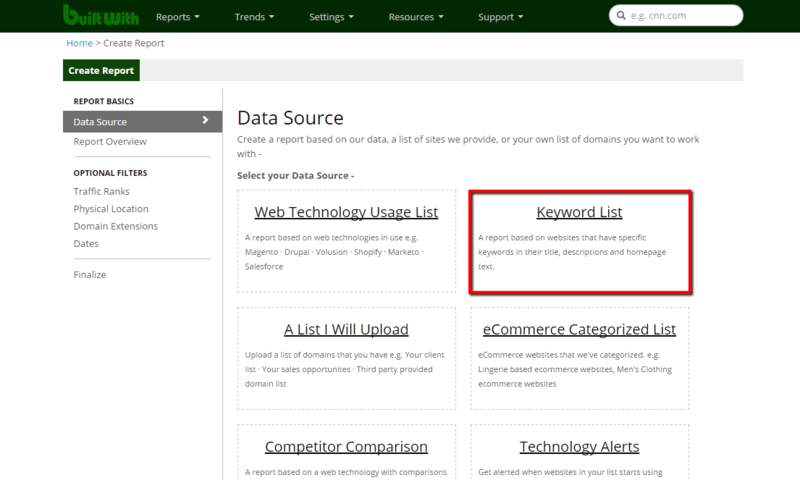 From your dashboard, click on the Create New button and then select “Keyword List” as your data source as shown in the image below. At the prompt on the next page, select to add a new keyword (unless you’ve used the keyword before) and type it into the “New Keyword” box as shown below. When you’re done, click next. Once you’ve clicked “Next” you’ll be able to finalize your report, give it a name and confirm your selections. If you want, you can filter the results at this stage using the optional filters shown on the left of the screen. I’m not going to do any additional filtering yet, so I’ll just finalize the report and wait for the results to be gathered by BuiltWith. Another way of accessing the Keyword Lists reports is to head over to the Keyword Lists page here and type your chosen keyword into the box as shown below. 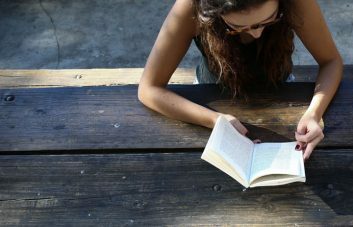 If you’re stuck for inspiration, you can see plenty of examples in the list underneath. Once you’ve selected your keyword, you can create a report by downloading the lead list. Just click the button as shown in the image below. This will create a report which is accessible from your dashboard, just as if you’d created a new report using the steps I showed earlier. 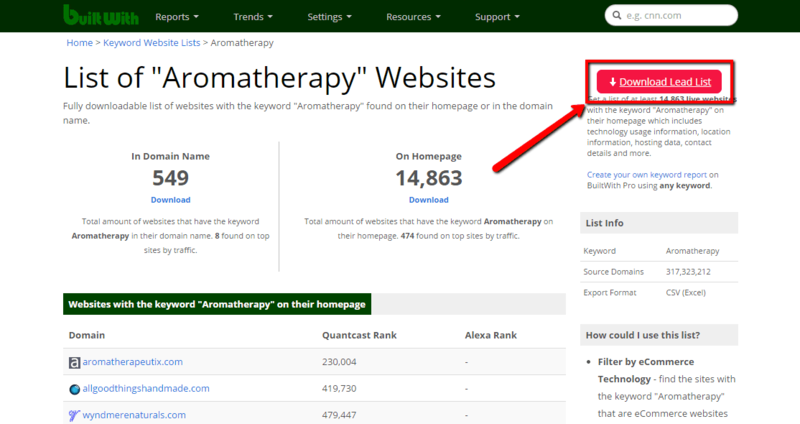 After following the steps above, I now have a report identifying more than 14,000 sites with the keyword “aromatherapy” on their homepage. My next step is to refine those results. In this example, I’m looking for sites that use Magento. 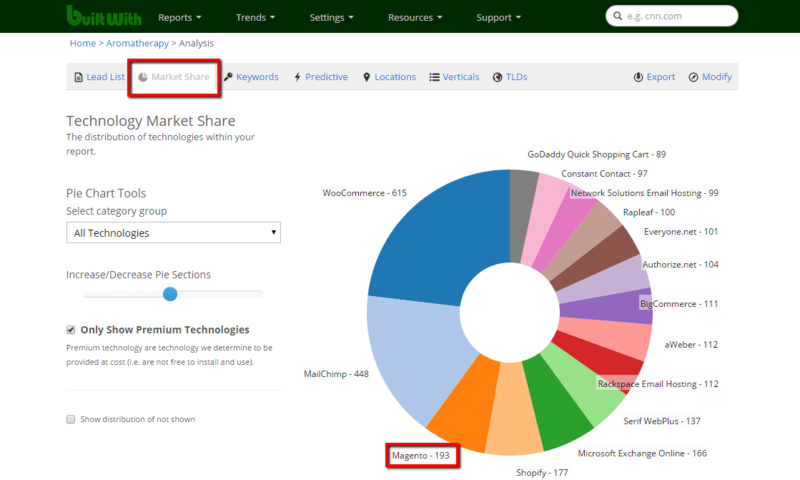 To find those sites, click on the “Market Share” tab inside the report and then on “Magento” shown in the pie chart. Here, the “193” next to Magento shows that BuiltWith has found 193 sites which match the filters I’ve set up (in this case just “aromatherapy” as a keyword and “Magento” as a technology). If the technology you’re interested in isn’t shown in the pie chart, you can select a category (in this case, eCommerce) using the drop-down menu on the left and then find your chosen technology. After selecting Magento and scrolling down a little, we can now see a list of sites which meet the criteria. At the bottom of the page is the option to create a new report of the sites using Magento. 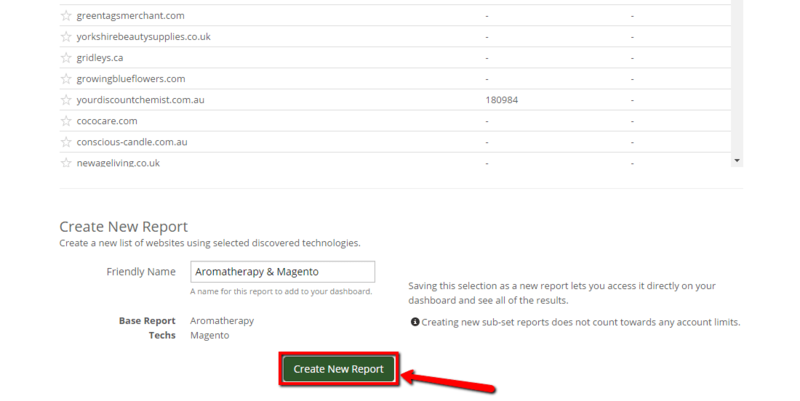 Clicking the “Create New Report” button, as shown below, will add the report to your dashboard. So now we have a report in the dashboard showing details of 193 sites using Magento with the keyword “aromatherapy” on their homepage. At this point, we have a list of sites which match our criteria. 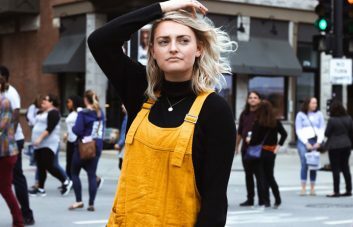 You could use this list of highly targeted leads however you want but today, I’m just going to take a closer look at a couple of the sites. 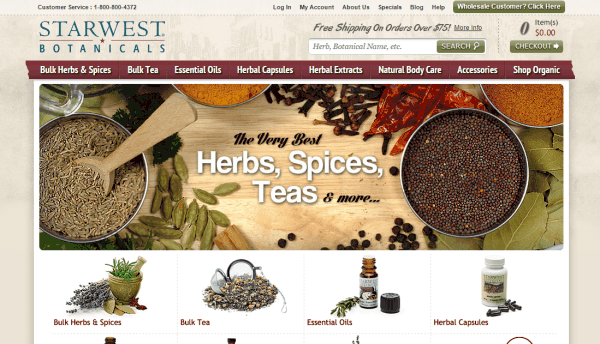 First up is Starwest Botanicals, a herbs and spices eCommerce store. 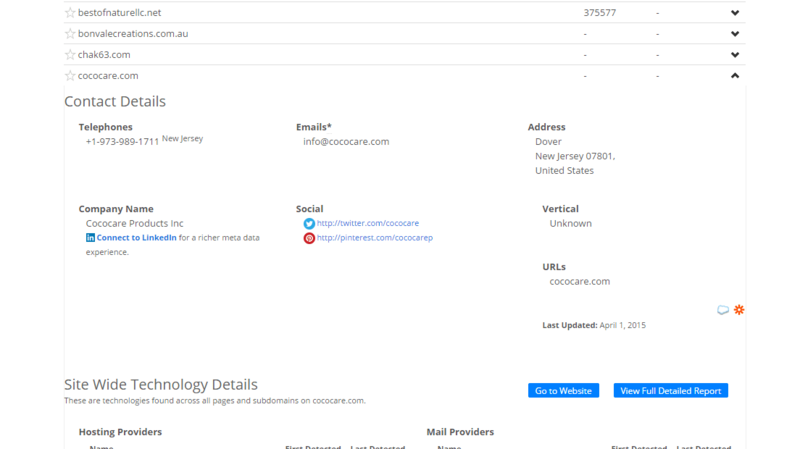 In the result in the BuiltWith report we can see details about the site including telephone numbers, registered address and a list of technologies implemented on the site. 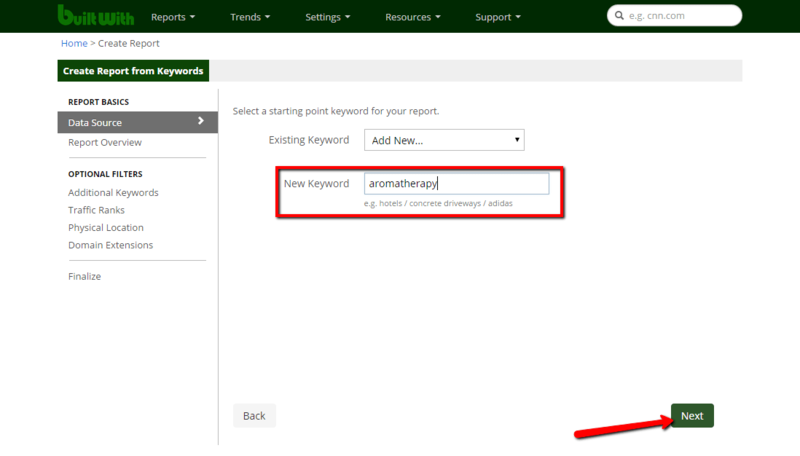 Just in case you’re in any doubt, the image below shows a section on the homepage all about aromatherapy (which was the keyword we filtered for earlier). Another result on the list is Cococare. 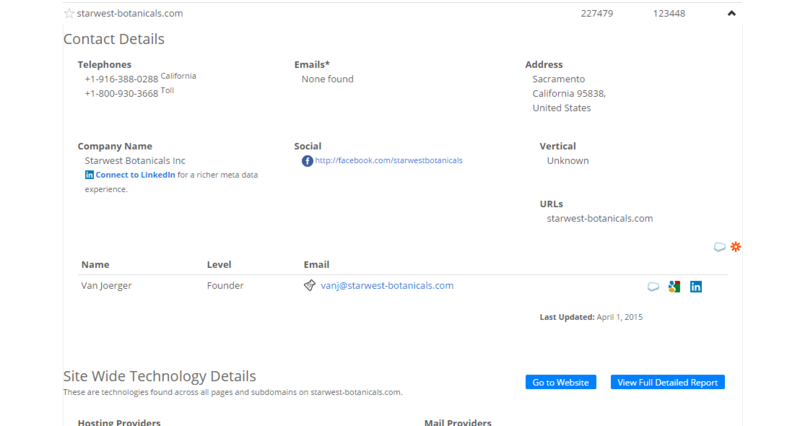 This is a site outside of the Quantcast and Alexa 1m and would have been difficult to find using any other method. As before, we can see details of the site in the BuiltWith report as you can see below. 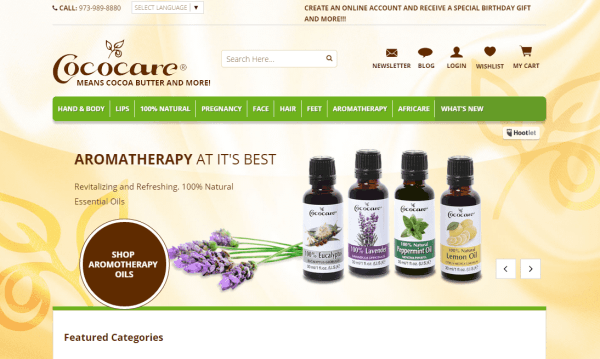 And here, on the homepage, we can see aromatherapy products featured front row and center in this Magento powered store. If you’re interested in generating reports like this and compiling lists of highly targeted leads, BuiltWith Pro might be for you. Chris Walker is an engineer by day and a freelance writer by night. Sometimes a little too keen on working with data, he loves finding patterns and hidden stories buried in the numbers.